Nothing but change is permanent, a reality which you can see associated with almost everything around you. Similar evolution can be seen in women’s jewelry which, since recorded time, has been a fashion item among women of all ages, and necklaces are a centerpiece of individual fashion and personal preference, adding that perfect touch to most any attire. It’s not just the clothes which attract the eye of others, but, most often, the necklace one wears. Necklace styles over the last half century have seen great variances in design, style, and material. The necklace which your grandmother wore when she was young is like to no longer have a place in today’s fashion, and is loved and shown mainly as a retro fashion statement. While designs have changed, some things remain constant. Fifty years ago gold was the primary necklace material (including any designs). Also how can you not mention the “rani-haar” and the “Nau-Lakha” (not sure what that is: see picture above: necklaces originally designed and worn by South East Asia royalty which features multiple golden front strands, a design that was also very popular in the West for many years). While gold remains the chief material of the chains, intricately designed jewels now dominate the design. Copper and silver have seen an increase in use as well. Over time, gold started getting replaced by other options with diamonds becoming more and more in demand. Other pieces which have remained in fashion over the decades include beads and pearls. Beads and pearl necklaces, predominantly displayed in white many years ago, are now obtainable in almost every color, to allow the wearer to match her attire. Fashion jewelry is another in demand jewelry piece which has been liked by women who prefer style and wish to create that unique look. Certain designs and material are timeliness: simple gold chains with a single jeweled pendant, and matching earrings, for example. However, over the years, material and manufacturing capabilities have evolved to create an almost endless variety from which to choose. From necklaces made of paper mace, to intricate designs that incorporate different jewel shapes, sizes, and colors. It can be stated without hyperbole that necklaces of any style, color, design, and price can now be found (or special made!) to satisfy the specific fashion need and budget of any individual wearer. Necklaces can also be a wonderful gift for that special woman. But be sure to understand her tastes and current fashion! And one final thought regarding the woman who keeps a large collection of necklaces and other fine jewelry treasures: the jewelry box. 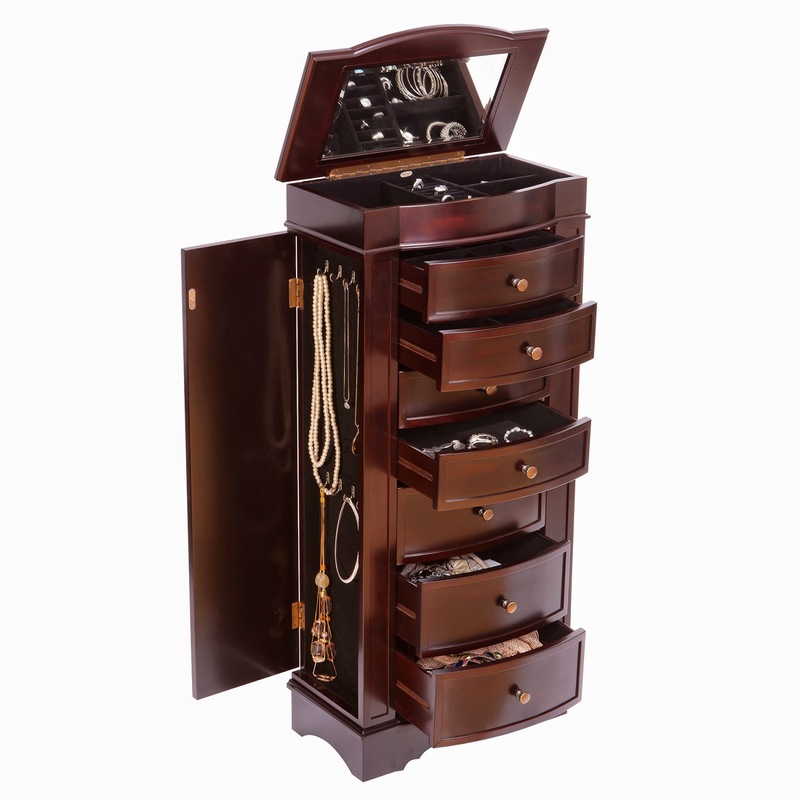 A standing jewelry armoire that features side necklace cabinets will keep her necklaces safe and secure for her entire life, and is a practical and elegant gift. Happy treasure hunting from ChasingTreasure!